Curtain call after a rousing Beethoven 9th: (l. to. 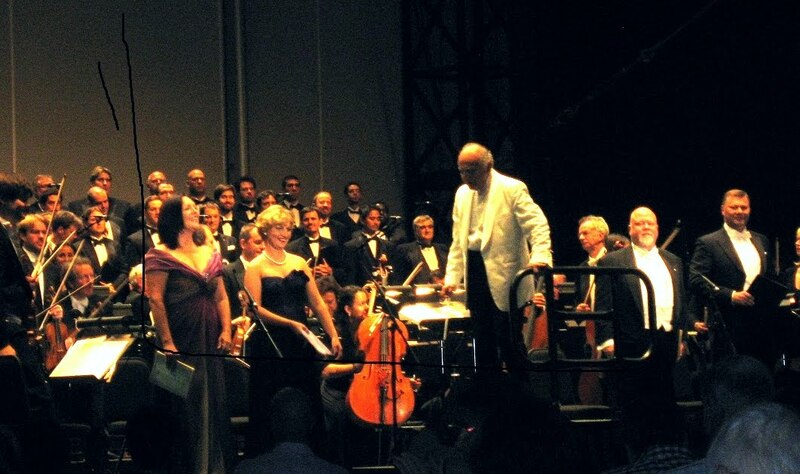 r.) Adrianne Pieczonka, Ekaterina Metlova, Lorin Maazel, Richard Margison, Rene Pape. Background is the London Symphony Orchestra and the Black Creek Festival Chorus. It seems just yesterday when the inaugural season of the Black Creek Summer Music Festival opened auspiciously with the Domingo-Radvanovsky Opera Gala on June 4. It was an exciting evening of music making - complete with spectacular fireworks, good attendance and the blessings of the weather gods. Despite the high musical standards of the opening gala and the subsequent shows, Black Creek has not been smooth sailing for Garth Drabinsky and the Festival organizers. Toronto doesn't exactly have a history of summer classical music - it's been a half dozen years since the COC and the National Ballet played in Harbourfront, and one have to go back 30 years since the TSO played in the Ontario Place Forum. After all these years, any attempt to develop an audience base is going to take time. The Rexall Centre, better known for tennis, is advertised as being "in the center of Toronto" but in reality is anything but. Located at the northwest fringes of Metro on the grounds of York University, it's not so easily accessible by public transit, and the much publicized traffic chaos - not to mention the hefty $20 parking tariff - scared some people away. Attendance figures have been very disappointing, forcing drastic ticket price cuts, and worse, the cancellation of a number of shows. Opera lovers who were looking forward to hear Denyce Graves and Roberto Alagna were sorely disappointed, as three of the high profile classical shows bit the dust. German bass Rene Pape's All Russian Program was reduced to a 10-minute Coronation Scene tagged onto last evening's Beethoven 9th, which served as the final concert of the 2011 Black Creek Festival. (Originally the final concert, to take place on Aug. 31, was to be French tenor Roberto Alagna and Bulgarian soprano Svetla Vassilieva's Canadian debut) Music al fresco is always subject to the whims of Mother Nature, and Black Creek was no exception - Tony Bennett and Diana Krall were cut short, leading to considerable audience grumbling. Barry Manilow earlier in the week had to be postponed two days due to a torrential downpour. On top of it all, there was a dispute with the chorus over compensation for the cancelled concerts, made public by British critic Norman Lebrecht on his blog, Slipped Disc. As a result, the Beethoven 9th evening with Maazel and the London Symphony went ahead under a bit of a cloud. At least the weather gods relented and the concert was blessed with excellent weather. The quartet of soloists included two well known Canadians - soprano Adrianne Pieczonka and tenor Richard Margison, plus the great German bass Rene Pape in his Canadian debut. Rounding out the cast was the young Russian mezzo Ekaterina Metlova. While it was sad that the Pape concert was cancelled, we at least got to hear his magnificent bass in the Coronation Scene from Boris Godunov. His voice is simply immense - he probably didn't need the amplification last night! The chorus under Robert Cooper rose to the occasion and provided powerful and incisive support. It was too bad that it was only 10 minutes long - if only they had included the Death of Boris! There was a 5 minute pause before the start of Beethoven 9. Maazel must have conducted this piece hundreds of times in his long career and could have done it in his sleep. He conducted it last evening without opening the score in front of him. It took a bit of time for the LSO to warm up - the first movement was rather indifferently played. By the Scherzo, it started to build to a shattering - and loud - Presto, the final movement. These outdoor concerts typically attract some people who don't normally attend symphony concerts, and the movements were interrupted with applause - there was even one embarrassing moment when some over-zealous audience members applauded right in the middle of a movement. Voice fans waited patiently for the "Ode to Joy" and given the excellent quartet of soloists, they were not disappointed. Pape led off the proceedings impressively with his gargantuan bass. Soprano Adrianne Pieczonka showed off her well focused, gleaming tone. Tenor Richard Margison, last heard locally as Bacchus in the COC's Ariadne auf Naxos, was in fine voice, with a timbre perfectly suited for this work. Beethoven doesn't really give the alto any opportunity to shine in this piece - her inner melodies just doesn't get noticed unless you listen hard. As a result, Metlova really made little impression here, but hopefully we'll get to hear her again in Toronto in the future. The Black Creek Festival Chorus put aside its unhappiness and gave a thoroughly committed performance. As mentioned earlier, Maazel is the old hand and his experience showed - the orchestra played with true if not flamboyant tone, and Maazel's increasing intensity suitably built to an exciting climax. Let's hope that Black Creek will persevere and return next season, as the organizers promised. Toronto needs a high profile festival such as this and it deserves the full support of GTA music lovers. Beethoven is the best! He has been loved by so many people because of his music that touches people's heart.